Heavy red and blue lights illuminate the stage of Prince Arthur St.’s Petit Campus. The atmosphere is relaxed and a few people are ordering drinks at the bar. On the open floor, the crowd, a colourful mixture of young and less young people, sit casually at dispersed tables. Some came alone, others in groups. Some are here for the first time, others come every week. With these words, one more weekly edition of Kalmunity’s Live Organic Improv Tuesdays gets underway. To the crowd’s delight, the first set starts with a mellow and jazzy beat. The band is quickly absorbed by the harmony created by their instruments, and soon seems to forget that people are watching, as if they were simply jamming in their living room. By the time three vocalists slowly walk to each mic, the high energy in the room is palpable. Rain, shine, or snow, every Tuesday night rotating musicians, poets, vocalists, rappers, and dancers all with various cultural and artistic backgrounds come together on stage to create spontaneous and improvised music. 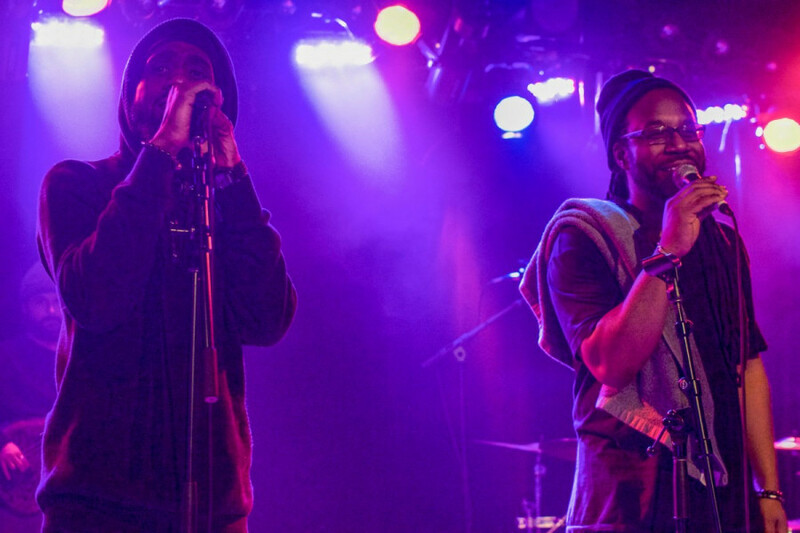 From spoken word and soul, to hip-hop and reggae, Kalmunity takes a different form every week. “It’s about combining all of these styles, because music is oneness and that’s what we’re trying to show,” said Promesse. Some nights, the ambiance is relaxed and mellow while other times, as Promesse puts it, people dance “to the end of love.” But every week, art is created here in its most honest and raw form. Promesse founded Kalmunity Vibe Collective in 2003. “We started it to create a platform for Black popular music like hip-hop, reggae, R&B, funk, and soul to be explored,” he explains. Since then, it has grown to be one of Canada’s largest urban music collectives. Born and raised in Montreal, Promesse fell in love with drums as a child when his stepfather taught him how to play. He has been seeking new sounds ever since. For the following decades, Promesse’s passion and talent for music earned him a commendable reputation. He has played and toured with various bands playing roots reggae and dancehall (a modern derivative of reggae) to alternative rock. While he was immersed in the music environment, Promesse saw great potential in Montreal’s late-90s and early-2000s emerging urban poetry. “These stories have to be told [through] this music,” he thought then. 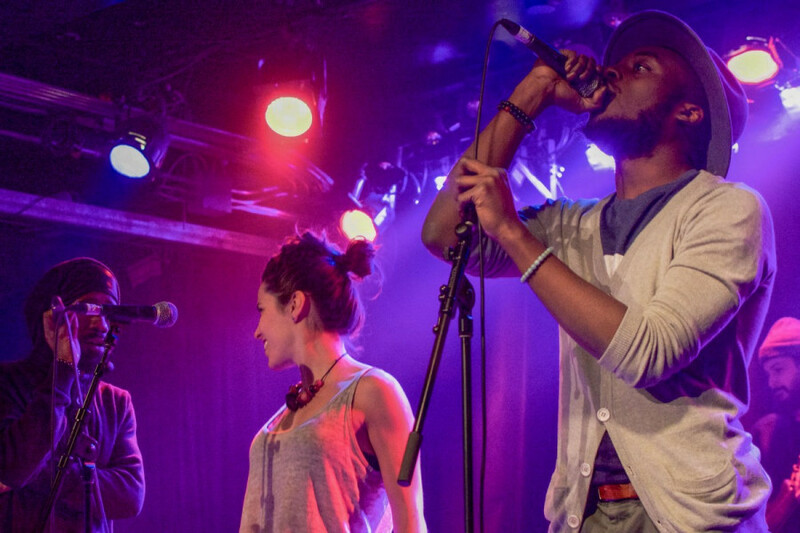 Promesse sought to unify Montreal’s growing urban music and poetry scenes. To do so, Promesse used his creative skills and charisma to establish a large network of performers of different genres from all over the city. “We wanted to give a voice to the voiceless, and create a platform for storytelling,” Promesse said. “It was a way to use these popular forms of music to bring different content to people’s consciousness.” With the help of a dozen musician friends, Kalmunity was born. Administrative Director, known by his stage name Preach Ankobia, says that the name “Kalm-unity” was Promesse’s idea. “[Promesse] wanted to create something that unified the masses while providing a calm reflective energy,” he said. The wheels were turning, but finding a venue to host his ambitious project was harder than he had imagined. The concept of music improvisation was still mostly unknown to mainstream audiences at that time, and venues were reluctant to accept a group of emerging artists. Luckily, some friends had opened a small eatery called Sablo Kafé in Little Italy. Based out of there, Promesse and his friends started hosting regular improvisation sessions. “It was very intimate, totally different, and, in fact, a very scary way of performing,” he said. Shortly after its debut word got around and the event turned into periodic cultural gatherings. The tight space quickly filled with curious listeners, leaving barely any space between the performers and the audience. As Kalmunity’s popularity grew, they relocated to Le Consulat Bar & Lounge on De Bleury St. From there they secured a spot on St-Laurent Blvd. at Les Bobards. 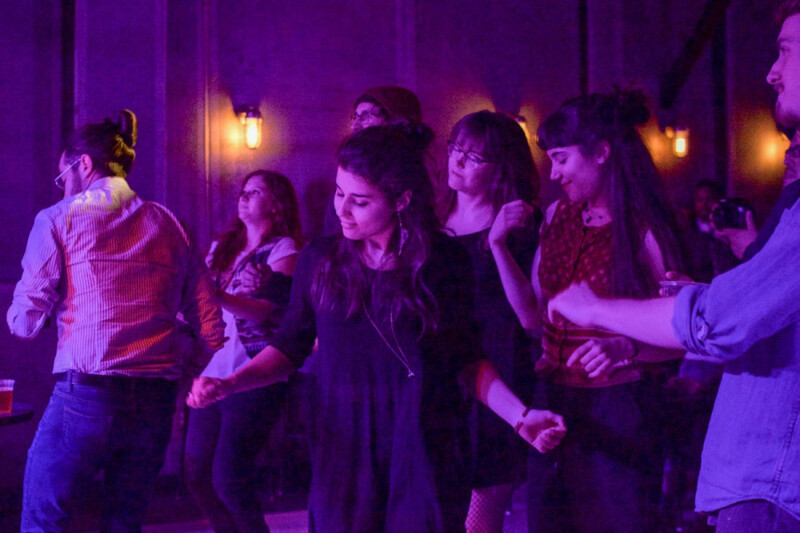 Since last year, Kalmunity Tuesday improv nights are held at Petit Campus, on Prince-Arthur St.
A climactic saxophone solo marks the end of the first set as the hyped crowd crammed onto the dance floor cheers heartily. This year, Kalmunity is celebrating its 15th anniversary. For the occasion, Promesse and Preach put together Kalmunity Music Week. From May 1 to 6, various themed shows will be held across the city. Along with being an emcee and rapper, Preach is in charge of the administrative side of Kalmunity. “It has allowed me to sharpen my communication skills and helped me interact with the world in a more holistic way.” For him, Kalmunity is more than a mere collective of artists— it has become home. Kalmunity is in constant evolution. They have developed creative programs like Kalmunity Music and Poetry Workshops aimed to inspire and encourage emerging artists. Promesse believes that participating in live improvisation prompts artists to step out of their comfort zone. “There’s something real about it, something honest, something soulful about it that you can’t really teach, you can only experience,” he said. Kalmunity Sunday Jazz Project is their second weekly event, held at Café Résonance on Park Ave. on Sunday nights. It is a warm and jazzier experience in a more intimate setting. Kalmunity also themes their events to highlight important dates. In February, for instance, they host their Black Liberation Sundays series during which they explore jazz through different eras and genres. For many performers as well as audience members, Kalmunity is a form of therapy. “It’s something that is healing to the world,” said Preach. With an open heart, the founder has embraced artists from all walks of life. “The different stories, the different way people play, whether they’re schooled or whether they’re not, all make up the beauty of Kalmunity,” Promesse said. Being able to support his fellow artists is a must for Promesse. The platform he created 15 years ago keeps serving its purpose. Promesse believes the community is growing and the message is reaching. Promesse feeds off the good energy that he gets all around him.